The Maremma originates from two areas of central Italy; the Abruzzi, where the dog is called Postore Abruzzese and the Maremma where the dog is called Pastore Maremmano. 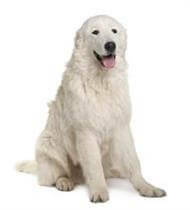 The two breeds are almost identical to the dog we know as the Maremma Sheepdog. The main function of the dog was to guard the flocks against wolves and bears, and more recently from thieves and wild dogs. The dog was left to use his own initiative in making decisions and that sense of independence is still strong in the dogs of today. In Australia, where the Maremma Sheepdog has been used as a stock guardian, farmers have reported a 35 percent reduction in losses from foxes, wild dogs and birds of prey. Maremma Sheepdogs live to about 12 years of age. The Maremma Sheepdog is typical of a livestock guardian, possessing a natural protective instinct. They are friendly and loyal to their own family but can be wary of strangers. They like children in their own family but need to be supervised when other children come to visit. They use their size and voice as a deterrent, and are not usually an aggressive dog. The Maremma Sheepdog gets on well with all animals be it the household cat or expensive livestock. If it is to be used as a guardian it should be introduced to its future charges as a puppy so that a strong bond will develop. Care should be taken to supervise the bonding initially, using young animals, so that the puppy doesn't get hurt while it is still too small to protect itself, and it is not advisable to leave a Maremma home alone with nothing to do. The Maremma Sheepdog has a double coat which is both weather resistant and water repellent and can quite happily live outdoors. The long white coat sheds copiously twice a year and at this time needs a thorough brushing, paying particular attention behind the ears and down the back legs. At other times the coat stays remarkably clean and free from tangles. In suburbia daily walks are a must. Maremmas are very intelligent dogs and need to have a purpose in life or they become bored and destructive. These dogs love water and will happily roll over in a puddle. Maremmas dislike having their feet touched, but in spite of this their nails must be kept trimmed. They are also wary of people they do not know, so do not expect them to be enthusiastic with visitors. This breed is for owners who like something different. The Maremma Sheepdog is very independent but devoted to their family. They will not abdicate pack leadership but may allow you to be equal. Always smiling they make a good companion as well as a working dog.